Login with your username and password or click on “create an account” if you don’t have an account. In this example we create an account. Type in your preferred user name and password. You will be identified by your user name, so every user name can only exist once. Retype your password in the lower field to ensure you typed it correctly. Wiki does not check the security level of your password. Select all cats in the above box. This ensures that you are a physical person. Enter your email-address. Email address is mandatory and encrypted when used for discussions in this wiki. The next fields are optional. 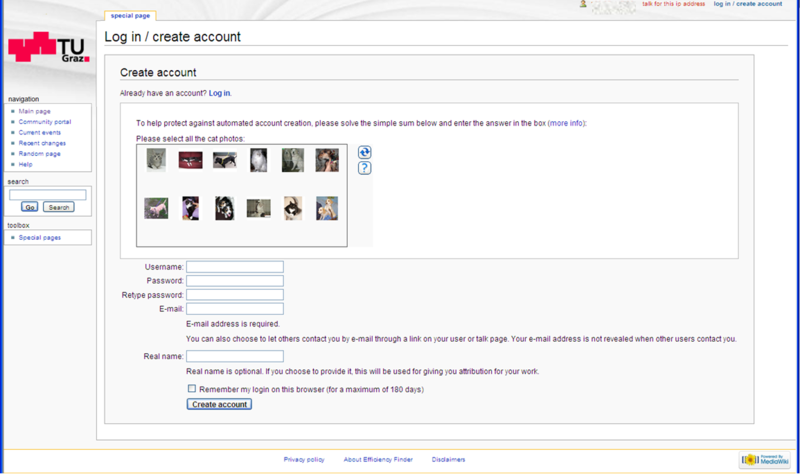 Hit “create account”. If everything is fine, wiki replies with the message shown below and you receive an email message also shown below. Otherwise read the reply carefully and repeat step 3 filling in your data. You are logged in and you see your user name on the upper right bar next to symbol . This account will last only for about one week if you don’t follow the next step. Check your emails for a message like the one above. Click on the upper link to ensure that both, email address and user name belong to you. You will see the message below on wiki. Now you are registered with your account. You might recognize that you cannot edit or create any page. The administrator assigns write access. This page was last modified on 28 August 2013, at 13:35.